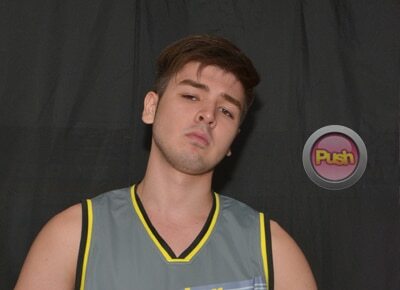 Andre Paras talks about his love for acting and basketball. After being launched in the teen movie Diary ng Panget, new heartthrob Andre Paras admitted that he is just enjoying learning the ropes of acting. “I'm in showbiz to learn also because I'm an aspiring cinematographer or director. I also love to do this because it's my dream in acting. Why not ‘di ba? If it's not conflict with my studies—because that's important for me to continue it because I enjoy doing it and I'm here already, I won't stop naman. It's something that is once in a lifetime. I know it's complicated but I'm getting used to it because if you love it parang you won't mind what’s happening, negative man or positive. If you love what you're doing, that's what matters talaga,” he told Push. The 6'4” UP varsity basketball player said that even though he is enjoying being in front of the camera, he is not willing to give up his sport just yet. “Well hindi naman because basketball is always there. Well not always there because there's a certain age din siguro yung desire so that's why I like playing basketball muna. So priority ko talaga studies and basketball. Yung sa showbiz kasi it just goes with the schedule. So I'm like doing everything. I know it's weird but I think I have the best of both worlds. I love acting and I also love making people smile as much as possible. I love playing the sport even if I don't have that much experience, I'm just a rookie. I'm enjoying both because you know, whatever happens we're both just entertaining people and that's what I think I love doing talaga,” he said. Andre said he has dreams of becoming an action star. “When I watch Hollywood, I like explosions and car stuff. My dream siguro would be something like The Fast and the Furious. I love really intense car chases and stunts also,” he added. After being thrust into the limelight at an early age because of his parents Benjie Paras and Jackie Forster, Andre said he has readied himself to handle intrigues about his family or himself. “I just don't mind it I guess and also if ever I just don't talk about it because there are better things to talk about and focus on. It's my inspiration. Like any player, when people throw negative stuff, obviously you use that as motivation to prove them wrong,” he explained. After working with Diary ng Panget cast members James Reid, Nadine Lustre, and Yassi Pressman, Andre said he has gotten used to working and training in sports at the same time. “The difficult part was the staying up late talaga because I'm an athlete, I'm used to sleeping early. But since it was summer din and it was work, and I inspired to do it din because of the people and also my friends were there. We just met when they told us who the cast members were and when we were together everyday for taping and right now we're all close friends,” he recalled. As one of the new teen heartthrobs in showbiz, Andre admitted he does not have any signature ligaw style. “I don't know. I'm single pa eh (laughs). My crush is of course Solenn Heussaff. I really admire her working skills because she's very busy, she's singing, acting, she's hosting and all that but I'm surprised that whenever I see her she's still smiling and then she's just very hard-working and that's what I admire talaga from her. I use that as inspiration kasi babae siya then kaya niya lahat i-balance,” he shared.